Median Prices for Single Family Homes (including Condos, Co-op) for Clark County, Washington state in Portland Metro area. Annual data collected for the month of June for each year. Click to enlarge. The north side of Columbia river neighborhoods, in Washington state, also saw almost 10% price increase every year in last 5 years. However, the prices are comparable to Washington county and much more affordable than Multnomah county. 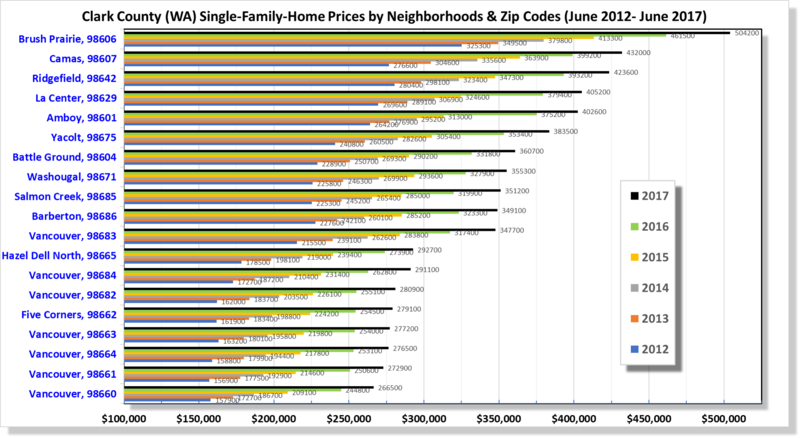 The cheapest neighborhood is right across the bridge over I-5 while most expensive ones are on north-east & east of town. Camas, the 2nd most expensive one, has a median household income of $100,000, almost twice that of Portland Metro.